Our Okanogan Chapter of the Washington Native Plant Society has been actively involved in four different projects for our area. Click on the links below to read about certain projects or scroll through the whole page to see them all. 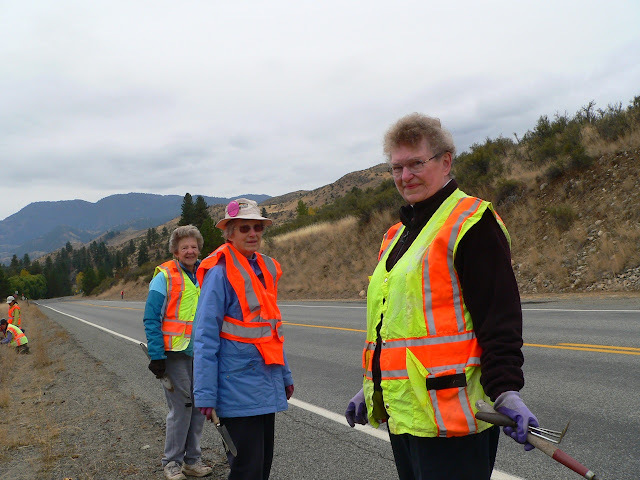 Since autumn of 2008, chapter volunteers have cared for a short stretch of roadside along State Route 20 between Winthrop and Twisp. We broadcast native plant seeds, plant native plants, and fight weeds with hand-pulling rather than herbicide. Every year we sign a No-Spray Agreement with the Washington State Department of Transportation (WSDOT). Ordinarily such agreements are between landowners and WSDOT; the Naturally Beautiful Roadsides site is on WSDOT right-of-way. When our group first met in 2008, we identified the following goals. Roadside volunteers meet to pull weeds once each spring, and to both weed and seed once in the fall. Rain or shine, we meet from 9:30 a.m. – noon, though any volunteer is welcome to put in only a part of that time. 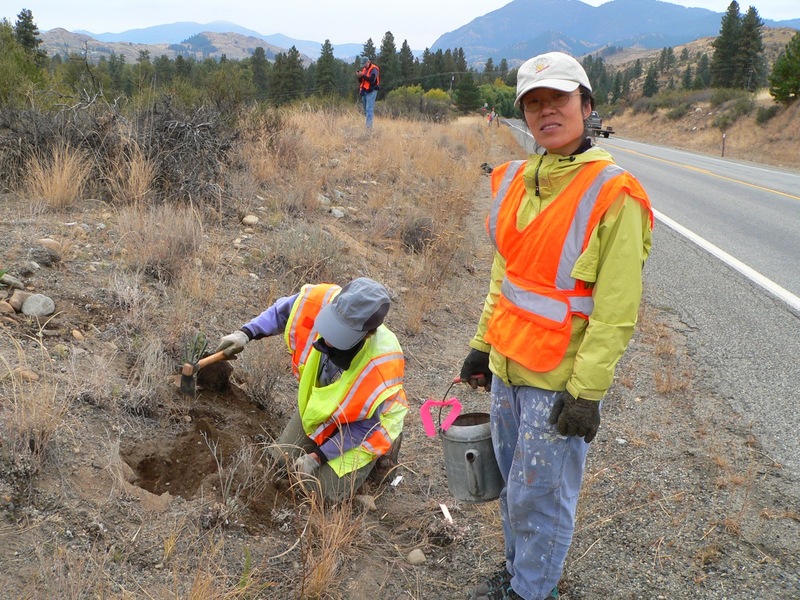 We post WSDOT warning signs while we work, and volunteers use WSDOT reflective safety vests. Since 2008 we’ve made good progress in altering the character of the site. Where cheatgrass and Russian thistle were in ascendance, we’ve had good results with snow buckwheat, yarrow, bluebunch wheatgrass, sand dropseed, needle-and-thread grass, and an assortment of other natives. Not all of us are native plant experts; beginners are welcome. Every time we meet, we review the native plants we want to encourage and the invasive plants we need to pull. There’s always something new to learn each time we visit. The site is between mileposts 198.7 and 198.9 approximately, on both sides of the road. Travelling from Winthrop to Twisp, the site begins at a black mailbox on the right marked Autumn Lane, and a guardrail on the left. It ends at the turning on the left for the Old Twisp Highway. If you're coming from Twisp, fork right at the Old Twisp Highway intersection on the right, directly after "Cannon Beach". If you're coming from Winthrop, you'll hairpin-turn left onto the Old Twisp Highway, directly after the black mailbox on the right marked "Autumn Lane". We park on the Old Twisp Highway, well down the hill from where it intersects Highway 20. It’s a blind hill right there, and parked cars can surprise drivers exiting Highway 20. We welcome newcomers and inquiries. If you’d like to join us, or to simply ask a question, please contact Joyce Bergen. Early in 2012, the Methow Valley Interpretive Center, TwispWorks and Methow Natives partnered to create the Native Garden at TwispWorks. In 2012, the existing lawn was removed, the site was graded, paths and planting beds were created, and a fence was installed to protect the garden from deer. Planting began in spring of 2013. 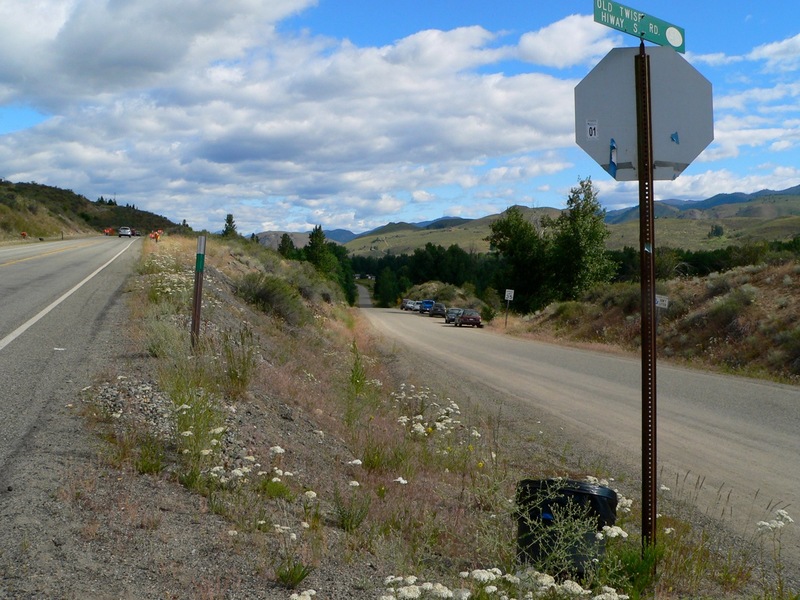 Methow Natives, the Methow Valley’s native plant nursery, will contribute plant identification signs, and an education grant from the Washington Native Plant Society will pay for additional signs. Future plans include interpretive signs, a pamphlet, and educational programs. 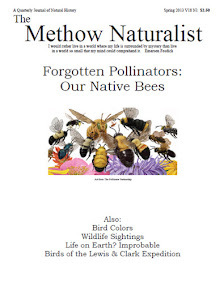 Methow Natives will be responsible for garden maintenance. Owner Rob Crandall plans to use a combination of volunteers and the nursery work crew during the first year, transitioning to a combination of volunteer and hired personnel as volunteers are recruited and funding becomes available. TwispWorks is a former Forest Service complex—a 6.4 acre site situated at the corner of Highway 20 and Glover Street (Twisp’s main street) and managed by the Twisp Public Development Authority. The property is being developed into a unique campus where artists, small businesses, craftspeople, educators and organizations can teach, exhibit, build, learn and create side by side; and where visitors can learn about the region, gain new skills, and experience the spirit of the Methow. Each of TwispWorks’ tenants and partners offers some form of education. One of those tenants is the Methow Valley Interpretive Center (MVIC), which focuses on the pre-European native inhabitants, geology, and natural history of the Methow Valley. 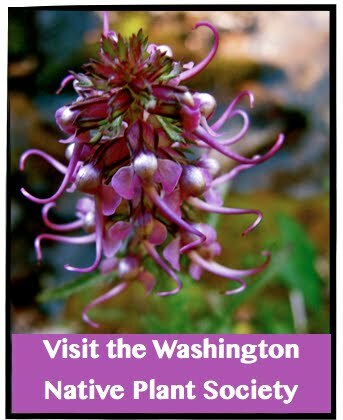 The Native Garden site is adjacent to MVIC and will serve as a gateway, drawing visitors to the interpretive center and inspiring them to learn more about the natural history of the Methow Valley. Methow Natives is a native plant nursery that propagates and grows native plants and uses them in restoration projects throughout the Methow Valley. Working with MVIC, Methow Natives has designed the garden for native plant education, highlighting native habitats, restoration, local geology, and cultural uses of native plants. The garden is also designed to complement and integrate with all other programs and outdoor spaces at TwispWorks. The garden is intended to offer an introduction to the valley’s unique ecosystems, deepening visitors’ appreciation and desire to help conserve the flora of the Methow Valley. Its diverse range of species, beautiful aesthetic, and focus on education are expected to draw people from all over the state, and beyond, to the TwispWorks site. TwispWorks, MVIC, and Methow Natives will collaborate to develop the garden, with MVIC and Methow Natives taking the lead on developing additional partnerships, raising funds and coordinating volunteers. Methow Natives will be responsible for installation, securing plant materials and overseeing construction and installation. The TwispWorks site has been chosen because it is so accessible to the thousands of visitors who come through Twisp annually to visit the spectacular landscape of the Methow Valley. The steady stream of visitors will make the garden an attractive place for local conservation interests to share their message with the public. The native garden will be organized according to habitat type. Shrub-steppe habitat will be a central focus of the garden, with garden beds developed around bluebunch wheatgrass communities with solid representation of other native bunchgrasses such as junegrass, Idaho fescue, and needle and thread grass. A diverse collection of shrub-steppe forbs will ensure that bloom continues spring through fall, and provide habitat for native pollinators throughout the season. Riparian habitat beds will offer a unique opportunity to showcase the concerted effort that has been put towards riparian restoration in the Methow Valley, with interpretive information focused on the importance of healthy riparian communities and riparian buffers. 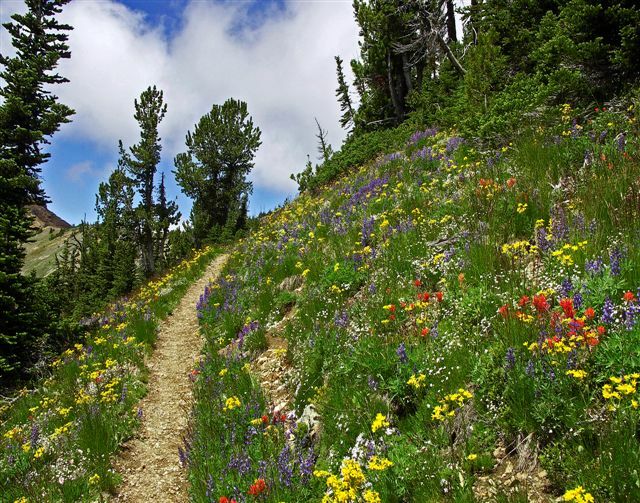 The subalpine habitat beds will offer a taste of the high mountain flora. Throughout the three habitat zones, several themes will be explored: geology, ethnobotany, non-native plants (including control), and pollinators. Central paths throughout the garden are surfaced with packed crushed gravel; they are wide and accessible to people of all ages and abilities. A mix of drip irrigation and microsprinklers is being employed to allow the garden to establish and thrive. Attention will be placed towards developing a landscape with a conservative water budget. Plant identification and interpretive signs will be an important aspect of the garden. All signs will be constructed of high quality, all weather materials. Interpretive signs will connect the importance of native plants with the local ecology, cultural history and community stewardship efforts. A self guided tour pamphlet will allow visitors to experience the garden independently. A low-maintenance landscape is planned, with mulches, weed barriers, and irrigation timers. A hired caretaker will work with volunteers to care for the garden; we anticipate that working in the garden will be a valuable educational component of the project. Currently in development, the Okanogan County smartphone app will be an interactive key to the vascular plants of Okanogan County, Washington. 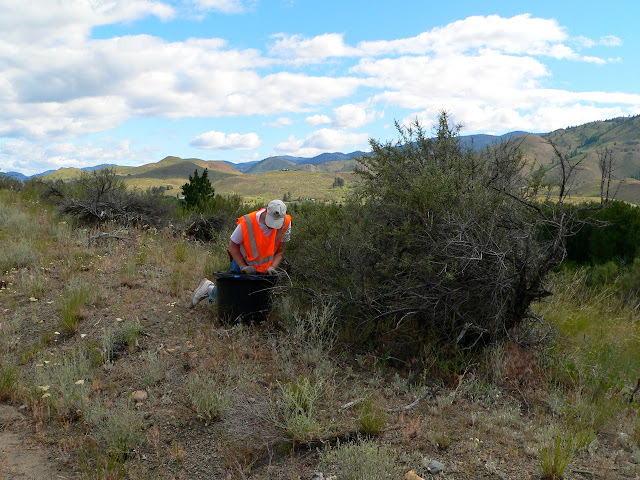 The app will provide information for over 1,500 vascular plant taxa collected or reliably observed within Okanogan County. The app is being developed to provide a portable key for use on mobile phones and handheld computers in the field. Because the electronic devices are compact and portable, they are particularly useful in the field. They are also easier to update and revise than the bulky printed guides that have been the field botanist’s mainstay. The first version of the app is being created for the Android platform by Bruce Barnes of Flora ID Northwest. The plant list was developed by George Wooten, Juliet Rhodes and Dana Visalli. Future plans are to port the app to an iPhone. In 2004, the Okanogan Chapter of the Washington Native Plant Society partnered with the Tonasket District of the Okanogan-Wenatchee National Forest to develop and install an interpretive sign at the popular Tiffany Springs trailhead on Tiffany Mountain. The Tiffany Mountain area is a topographically complex region comprising about 3,000 acres of diverse forests, alpine and sub-alpine meadows, and aquatic habitats. It sits about 25 miles northeast of Winthrop in the Okanogan Wenatchee National Forest. Elevations range from 6,000 feet at Tiffany Meadows to 8,242 feet at the top of the mountain. For more information and driving directions, click here. Photographed by Dennis O'Callaghan. Copyright 2005. All rights reserved. Through photographs and text, the sign describes this diverse and exciting place. The photographs were provided by Dennis Kirkland and Dennis O’Callaghan. On the Forest Service side, thanks go to Patti Baumgardner with Larry Loftis and George Halekas. Many thanks to all those in the Okanogan Chapter who worked on this project including Joyce Bergen, Sally Ranzau, Caryl Campbell, George Wooten, and Eric Burr. Tiffany Mountain is a panoramic setting for unfolding change. Glaciers shaped this landscape over 10,000 years ago, carving the north-facing cirques, and hollowing out the depression now filled by Tiffany Lake. Ice flowed around, between, and over many of the surrounding peaks, but Tiffany may be a nunatak, a geological term describing a mountain peak that protruded above an ice sheet. The climate warmed and glaciers receded. Plants colonized the newly exposed earth, eventually leading to the diverse communities on the mountain today. Tiffany hosts uncommon plants and animals that are typically found in forests far to the north, including boreal owls, boreal chickadees, Canada lynx, and Kotzebue’s grass of Parnassus. In the deep, moist soils by Tiffany Lake, riotous wildflowers thrive under canopies of Engelmann spruce, subalpine fir, and Douglas fir. Higher up the slope, whitebark pine and subalpine larch survive harsher conditions, while at the top, thin soils drain water quickly, and trees are left behind. Plants in this alpine zone hug the rocky soil, grow in clusters, or cloak their leaves with hairs to survive cold, desiccating winds. At this moment Tiffany and the surrounding peaks are alpine islands in a sea of coniferous forest, but change is ever present. Spruce beetle and mountain pine beetle are killing vast strands of Engelmann spruce and lodgepole pine. Fire, as natural to this landscape as the trees themselves, could come with a lightning strike. What will happen over the ages? If the climate cools, the treeline could slip down the mountain; if it grows warm, the forest could replace the alpine community. Time will tell, and for eons to come, Tiffany Mountain will be listening. The new Tiffany Mountain sign was a collaborative effort between members of the WNPS and the Tonasket District of the Okanogan Wenatchee National Forest. Pictured from left to right are George Wooten, Dennis Kirkland (standing), Joyce Bergen, Caryl Campbell, Patti Baumgardner (in front), Eric Burr, Dennis O'Callaghan, Mark Morris, and Larry Loftis (hard hat). Much of the text above comes from http://www.wnps.org/chapter_info/Okanogan/tiffany_mountain.html.